Saumya Joshi’s Gujarati play on which Umesh Shukla’s film 102 Not Out is based, was funny and had the novelty of a 102-year-old character, who wants to break the world record for longevity. A play turned into a film with very little alteration—except a few scenes shot outdoors—remains static. 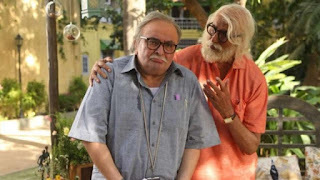 Three characters can hold up a play, they cannot quite manage that feat in a film, unless, of course, they are Amitabh Bachchan, Rishi Kapoor and the talented Jimit Trivedi. Not much is known about Dattatray Vakharia (Bachchan), except that he is 102, lives in an enormous mansion in Mumbai, dresses in colourful costumes and has a wet blanket of a son in 75-year-old Babulal (Kapoor). The wives are dead, so no women complicate this men’s world, into which only the slow-witted medical store delivery boy Dhiru (Jimit Trivedi) is admitted, for some inexplicable reason. No other relatives or friends around—which, if you ask a real Gujarati family, they’d tell you is very difficult though not impossible, to be so cut off from a clan. One day Dattatray decides that he will send Babulal to an old people’s home, because his chronic grumpiness is likely shorten his own life, and he wants to live on forever. When Babulal pleads for mercy, because he hates change, and still sleeps clutching a childhood blanket, the father puts forward a set of conditions that must be fulfilled. Dhiru is asked to serve as observer and umpire. Dattatray hopes the conditions will teach his son to get rid of old memories and start enjoying life again. One wonders why a father as strong-willed as Dattatray waited so long to alter his son’s life—there is a sort of explanation provided, but it’s not too convincing. For 20 years after the death of his wife and emigration of his son to the US, Babulal remained in a shell, and his father did nothing? A film needs more information and layering, which Shukla is unable to provide. Still, the stars and some witty lines ensure that there is enough for the audience to appreciate. Neither Bachchan nor Kapoor can manage the Gujarati accent required of them, but the former brings his indefatigable energy to his part and the latter, manages perfectly the sullenness and obstinacy of an overgrown child. It’s a wonder Trivedi does not look intimidated by the star power in the same frame as him. 102 Not Out is mildly amusing, but not memorable. Bollywood is yet to make the definite film about coping with age.